Many strategy game guides say things like "Scout early and keep scouting all through the game" to see what your opponents are doing. In MOO II your ships can't discover much about your opponents from a distance and, even if they enter a system occupied by an opponent, all they can see is colonies' current and maximum populations, the types of defenses that they have (e.g. Star Base, Missile Base; but not how advanced these are) and the nature, mineral wealth and any special features of planets in the system. But you can get a lot of more useful information without visiting opponents' systems. It's impossible to produce a comprehensive guide to interpreting this information, because the possible variations are endless. You have to develop your ability to interpret what the relevant screens say - and what they don't say, which is often as important. So this page presents an example of how much information you can extract from just 2 screens. Before we get into details, the lesson is: Use the Races (diplomacy) screens to check out all known opponents at least every 4 turns. The example below shows an opportunity. In other cases regular checking may save your empire by warning you of a threat, either military or from Spies. This tab of the Information Screen tells you the advantages and disadvantages of the founding race of each empire with which you have contact. It is accessed from the main Galaxy screen (hotkey I). They're Tolerant and have an industrial bonus. They're not Creative (unlike the Chessplayers and Psilons). They have no space or ground combat bonuses. There's another item that's important for the example below - it's game date 3516.8, i.e. turn 168. You will more usually get that information from the top right corner of the Galaxy screen, since every turn starts there. By the way, we're the Chessplayers - check out the race design. 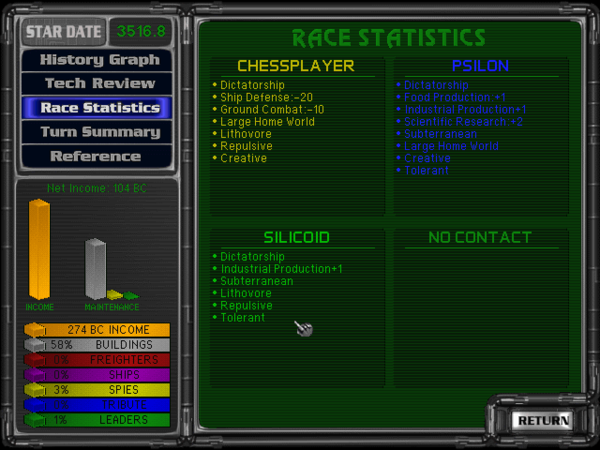 The Report screen is accessed from the Races Menu and gives information about another empire. The large panel on the right tells you what techs the other empire has. There are so many possible techs that the display is split into 4 tabs, each of which is scrollable. 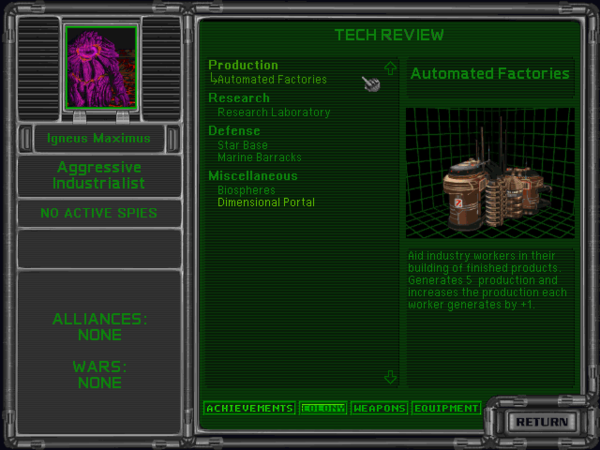 This example shows the "Colony" tab, which tells you about techs that help to make this empire's colonies more productive or provide ground-based and orbital defenses for them. This example of the Report about the Silicoid empire is also from turn 168 of the same game. The Silicoid empire's ruler is an Aggressive Industrialist. The main priority of "Industrialists" is usually building up their industrial capacity; but that's not an infallible guide and, as we'll see, this empire's industrial tech is very basic. "Aggressive" means this empire would instantly attack if it thought it could get away with it; the fact that it hasn't suggests it doesn't think it's strong enough. They have no Spies in our empire - if they had, their icons would appear in the box that says "No active Spies." So they are not currently trying to steal our techs or sabotage our assets. We can't read too much into that - a clever player stockpiles Spies and inserts a large number in one turn, hoping to catch the opponent unprepared - even the AI does it occasionally. The Silicoids are not currently involved in any wars or alliances. The Silicoids have only the lowest-tech industrial and research buildings. They appear to have no income-enhancing techs (if they had, the panel would have another heading, "Money"). They have only the most basic defensive buildings. They have discovered Dimensional Portal, which is at the 3rd-highest level of the Physics tech tree. The fact that the Silicoids are not Creative suggests they don't have the powerful Disruptor Cannon beam weapons, as that is the other tech at the same Physics level as Dimensional Portal; but it proves nothing, as they could have obtained the Disruptor Cannon tech by other means (tech trade, spying, conquest). The 2 previous Physics levels contain some powerful weapons, so we need to check the "Weapons" tab. In the game which supplied these screenshots, the "Weapons" tab tells us that the Silicoids' best beam weapon at this point is Neutron Blaster (in Physics), but they also have the powerful Proton Torpedoes (in the Power tech tree; and, unlike most torpedoes, they hit instantly, not 1 or 2 combat turns later), which means their ships can do considerable damage even if they have poor computers; and their best missiles are the basic Nuclear Missiles. The Silicoids have primitive research tech but have researched to very high levels in Physics and Power. With such limited research capacity they have very probably neglected other military techs, so we need to check the "Equipment" tab. As we suspected - in this game the Silicoids only have Class 1 Shield and Titanium Armor ("cardboard"), and primitive Electronic Computers. Zortrium Armor, so each Battleship has 200 armor + 200 structure = 400 "hit points". Class 5 Shields, which on a Battleship will negate 5 points of damage per weapon fired at it, absorb 100 points of damage in total before failing, and regenerate 30% per turn. These will make Neutron Blasters almost completely ineffective; but Proton Torpedoes are a real threat. Inertial Stabilizer, which makes our ships harder to hit with "beams". Cybertronic computers, which will make our "beam" weapons virtually 100% accurate as the Silicoids have no bonuses or techs that make their ships harder to hit. Gauss Cannon (the best weapons in the Force Fields tech tree; normal versions do 18 points of damage and HV versions do 27 points, with no range dissipation). Each of our ships has 4 HV Gauss Cannons, a battery that will punch holes in Class 5 Shields in 2 combat turns, and in lower-tech shields instantly. Mass Drivers (fully miniaturized as they're from the bottom of the Force Fields tree; with the AF modification, i.e. fire 3 times per combat turn). 15 normal-sized AF Mass Drivers per ship will shred targets that are unshielded or whose shields have been broken down by the Gauss Cannons. Our ships also have plenty of PD AF Mass Drivers, which will annihilate Nuclear Missiles. Structural Analyzer, which doubles all damage that penetrates the target's shields. 2 types of ECM Jammer. These are the best defenses against the Silicoids' Proton Torpedoes; but our ships are not equipped with ECM Jammers because we wanted to use the space for other things. Although it's now fully miniaturized, the basic ECM Jammer would have taken as much space as 5 normal-sized AF Mass Drivers, which would have been a significant reduction in firepower. But perhaps we should have included the basic ECM Jammers, as the remaining 10 normal-sized AF Mass Drivers boosted by the Structural Analyzer would do 360 points of damage per combat turn to an unshielded target. We have Ion Drive and are currently researching Anti-Matter Drive. Our ships' superior computers will enable them to shoot first, and we expect each of our Battleships to make 3 to 4 direct kills per per combat round because the Silicoids' shields and armor are so feeble. In fact they're so feeble that their drives are likely to explode, and each drive explosion is quite likely to destroy 1 or 2 of the adjacent "cardboard" ships. So we have a good chance that 10 Silicoid Battleships will be destroyed in 1 combat round, and our ships will not be fired on. If 2 Silicoid Battleships equipped with Proton Torpedoes survive the carnage, they may destroy 1 of ours, but it's extremely unlikely that they could destroy 2, because our shields and armor are quite tough. Our surviving ship would then finish them off. And if only some of the Silicoid Battleships are equipped with Proton Torpedoes we will destroy those first, because the rest can't penetrate our shields. In fact they probably won't hit our ships at all with their Neutron Blasters, and our PD AF Mass Drivers will destroy their Nuclear Missiles. All these screens also tell us our ground combat techs are far superior in every way; we'll skip the details. The "Colony" tab told us what to look for, and what we found says loudly and clearly, "Attack now, before they fit all their ships with Proton Torpedoes or get Mauler Device" (a brutal beam weapon that never misses, even if its owners have no computers at all; it's at the next level of the Physics tech tree after Dimensional Portal, and the Silicoids may be researching it now). As the Silicoids are Lithovores we won't have the burden of feeding any of them; and they're Tolerant, so we can build up the economies of conquered colonies as fast as we like. They're a very inviting target as well as an urgent one. So we make our non-shipyard colonies build 15 Troop Transports, timed so that the last is completed in the same turn as our 3rd Battleship. Our one obstacle is that at this stage our Iridium Fuel Cells do not give our fleet enough range to reach the Silicoids' nearest colony. We could switch research from Anti-Matter drive to Uridium Fuel Cells, which would provide just enough range; but it would take us 6 turns to get Uridium Fuel Cells. So we make an Outpost Ship, completed in the same turn as our 3rd Battleship; we're gambling that one of 2 unoccupied systems about half-way to the the Silicoids' nearest colony contains a planet, Gas Giant or Asteroid Belt where we can create an Outpost, which will put our ships within range of several Silicoid colonies. 4 turns after this Report our 3rd Battleship was completed and our whole fleet headed for one of the intermediate systems. 6 turns after this Report they reached the intermediate system, and it was better than we'd hoped: it had 2 good planets and was guarded by a Space Monster (not the Guardian!) which 1 of our Battleships easily killed, so we landed the Outpost Ship on a planet to provide a ready-made Marine Barracks when we later colonized it (we were a Dictatorship at the time, so the Barracks would speed up the colony's development by eliminating the morale penalty). 7 turns after this Report we conquered the first Silicoid system. 10 turns after this Report we conquered the Silicoids' homeworld. 17 turns after this Report we conquered the last Silicoid colony. It took so long only because after conquering the Silicoids' homeworld we were desperately short of Transports. We'd been running a large Command Points deficit and had to buy Alien Management Centers from nothing (4 BC per PP, i.e. 240 BC each) on many conquered colonies because the Silicoids' industrial tech was primitive, so our reserves became rather low; that meant we couldn't send additional Transports right after the fleet left. But the conquest more than doubled our empire's population and nearly doubled our income even before we built Spaceports and Stock Exchanges on former Silicoid colonies, so we were showing a profit before we'd finished conquering the Silicoids. The Silicoids never fitted their ships with Proton Torpedoes, and never managed to gather a large fleet in one place, not even for the final battle; the most our ships ever faced was 4, and they were destroyed by the first salvo. Most of our conquests were led by 1 Battleship, while the others guarded earlier conquests. And all this started from analyzing one Races (diplomacy) screen! This page was last edited on 20 August 2012, at 00:33.